This is the marriage document for my great uncle Louis Base and Helen Hudson. The document was filed in Council Bluffs, Iowa, on 07 March 1930. The groom’s name is Louis E. Base of Omaha, Nebraska, being 25 years of age (26 years at his next birthday). The bride’s name is Helen Hudson of Omaha, Nebraska, being 17 years of age (18 years at her next birthday) . 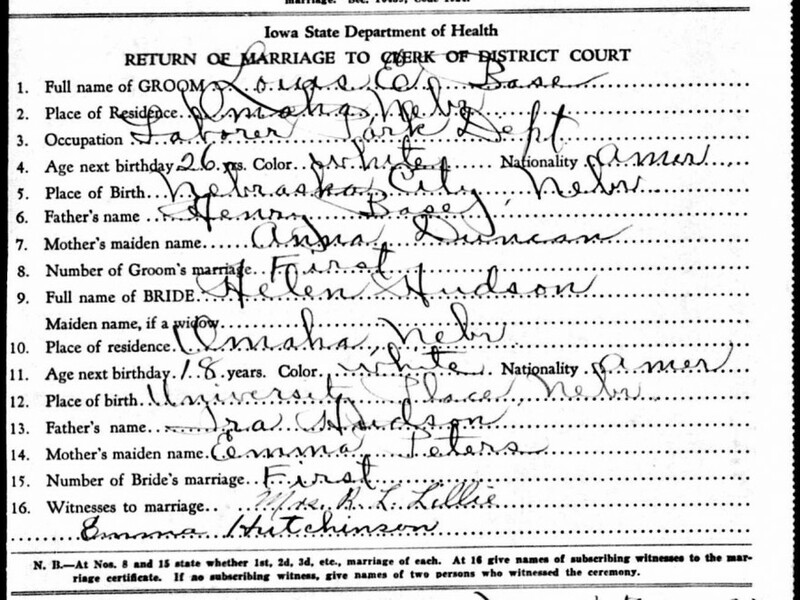 The groom was born in Nebraska City, Nebraska to parents Henry Base and Anna Duncan (maiden name). The bride was born in University Place, Nebraska to parents Ira Hudson and Emma Peters (maiden name).